ÖPPEN brings Melbourne’s version of a Scandinavian-inspired eatery to Windsor, with a modern simplicity that celebrates honest food and brews. Run by husband-wife duo, Zume Pham and Amy Vo, ÖPPEN brings the flavours of Denmark, Norway and Sweden; with a breakfast, lunch and open sandwich menu that focuses on quality and flavour. The kitchen is in safe hands with head chef, Zume, whose stints include working in the kitchens of Circa The Prince, Seven Seeds, Auction Rooms and Pillar of Salt. Pham and Vo have drawn inspirations from their visit to Scandinavia – the result is an effortlessly chic café that celebrates eating healthy, simple and delicious food. We loved both the dishes we sampled at ÖPPEN. 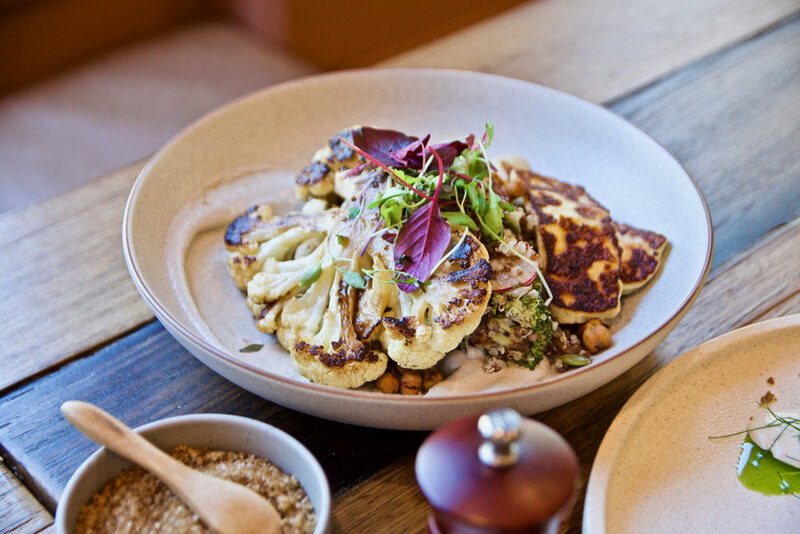 The cauliflower steak was a wholesome and absolutely moreish dish of charred cauliflower served with quinoa, chickpeas, charred broccoli, radish, currants, sunflower cream and pepitas. It was a truly beautiful dish. The dish of Hot Smoked Salmon was similarly delicious. Boasting a beautiful smoky flavour the salmon added the perfect level of salinity to the dish. The accompaniments of grilled asparagus, wild garlic, fennel, snow peas, watercress, dry rye and mustard sauce were each prepared with the utmost care and tasted wonderful together. As expected of any great Melbourne café, the coffee is excellent and made using beans from local roasters, Disciple, and poured by adept baristas ensuring the perfect brew.